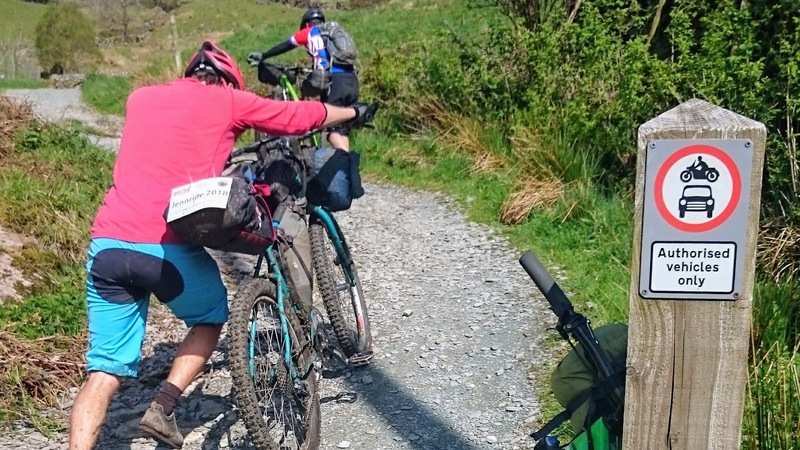 The Jennride is a bikepacking event in the Lake District organised in memory of Jenn Hill, the cycling journalist and racer who died of lung cancer in 2015, and I had heard great things about it from a couple of friends last summer, so I booked myself a spot as soon as entries opened in January. 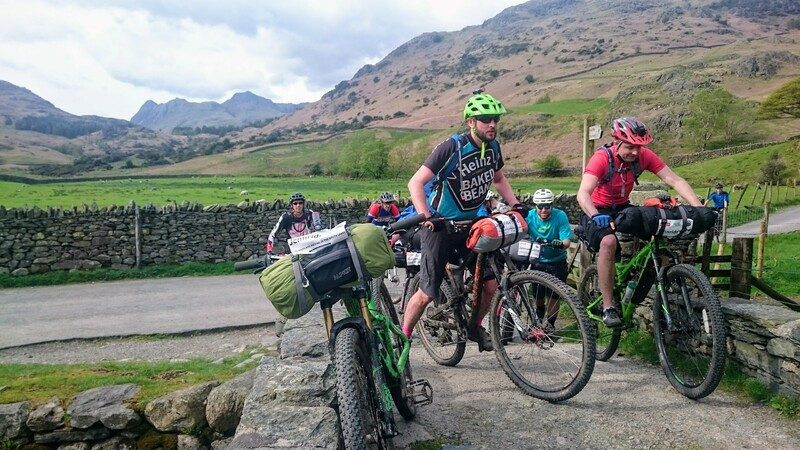 This year saw a choice of three routes to follow, with a 50km option aimed at first-time bikepackers, and a shot at the Lakeland 200 for absolute lunatics, in addition to the 100 mile main event. I was slightly worried that my current level of fitness might not be sufficient for the headline ride, but I was reassured by the fact that the convoluted course had numerous bail-out options and loops that could be easily shortened or omitted should there be any failure of equipment, body, or sense of humour, so I went for the off-road century option with a planned overnight stop roughly halfway round the route. Saturday morning saw riders line up under mostly blue skies, and we set off at 9.30am for the first hill of the day, Green Quarter, which spread the field out nicely before we all hit the long push up Garburn Pass. This climb to the second-highest point of the whole ride was a slog and even taking it easy I was starting to feel the effects of the previous night’s beers, which was slightly worrying. I took a couple of paracetamol and pressed on, only to puncture on the fast, slatey descent into Troutbeck. A quick repair of the slashed sidewall had me on my way again, and rolling down a bit more carefully I passed several other riders who had suffered the same problem. By the time we had made our way up from Troutbeck and down Jenkin Crag into Ambleside my headache had faded, and happily it stayed away for the rest of the weekend. By this time our riding group had settled down naturally into a quartet of me, Daz, Russ and Anthony, and we remained together for the rest of Saturday and most of Sunday, although of course we met up and rode along with numerous other riders and groups at various points over the course of the weekend. We took advantage of the offer of free cake and coffee at the Alpkit shop, where I was also able to pass on my thanks to ride organiser Rich Munro, who happens to have been the marshal who scraped me off the course when I smashed my leg up at the Grizedale PMBA enduro the other year. 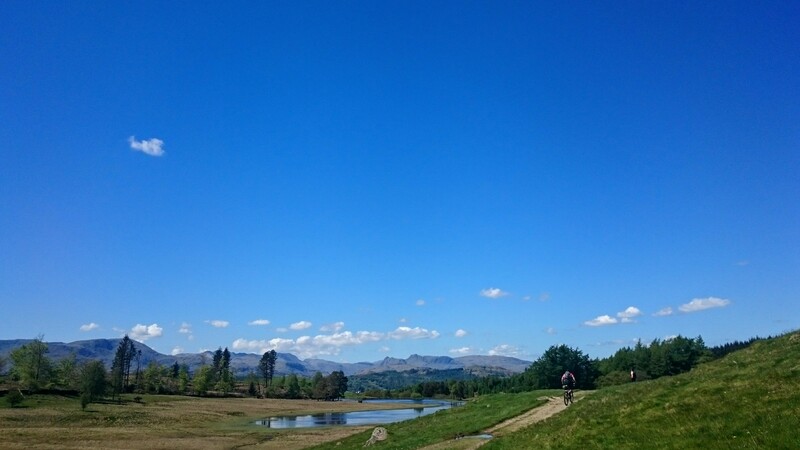 The next stage of the ride took us along the coffin road from Rydal to Grasmere, then back down the other side of the valley via Loughrigg Terrace, where I witnessed a chap on a fully laden, rigid fat bike accidentally ride off a two-foot high drop without crashing, most impressive. 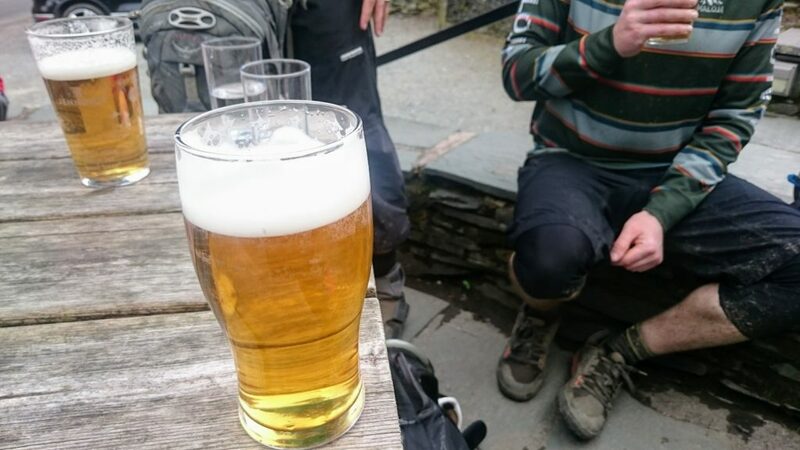 The sharp little grind over Loughrigg saw a few of our group lagging somewhat so we determined to stop at the next available hostelry to refuel with chips and beer (bikepacking is generally quite a laid-back form of athleticism, even compared with normal mountain-biking). We rolled into Chapel Stile in Langdale and left the route slightly to visit The Wainwright, where we topped up the fuel tanks. The route takes a southward trend from Great Langdale, aiming roughly for the hills north of Hawkshead, and on this leg of the ride we ended up in a fairly large bunch, rolling along admiring the views and chatting companionably with complete strangers, vaguely familiar faces, and old friends alike. 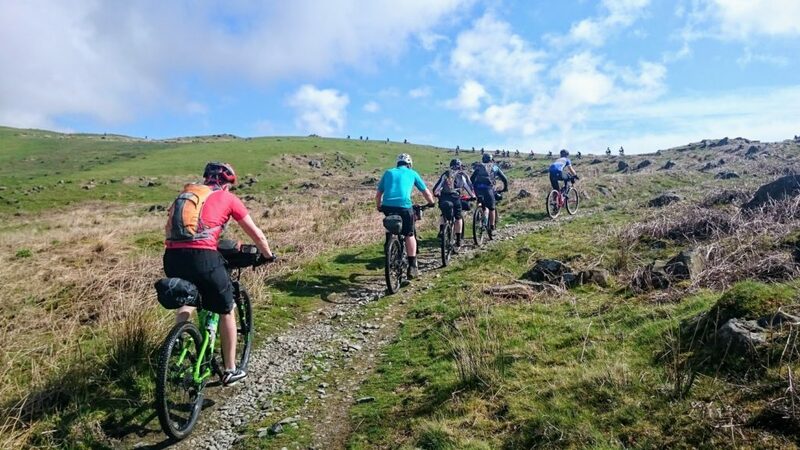 The mass-start bikepacking event is clearly a gregarious experience, although of course if you do fancy a little peace it’s simple enough to either ride off the front or drop off the back. Having said that, it is pleasantly easy to make friends with people who are clearly just as mad as you are, and in pretty much the same way. 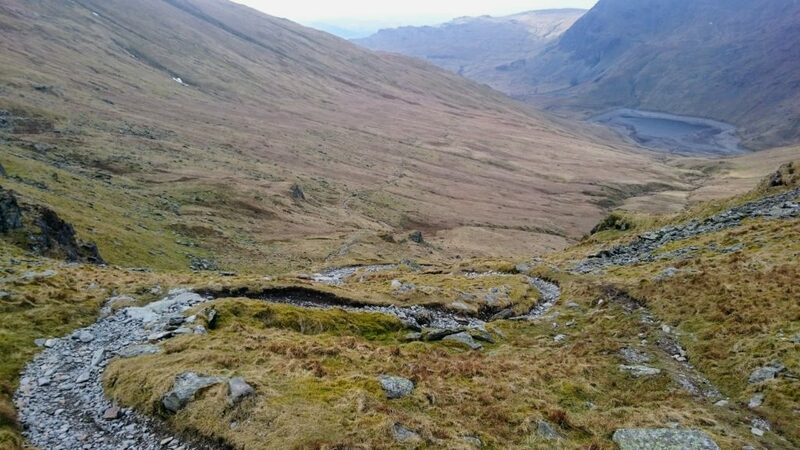 Little Langdale, High Tilberthwaite, Hodge Close, Iron Keld; the place names and miles ticked past through the afternoon, with only an unintentional dismount into an extremely foul stagnant puddle to detract from the otherwise enjoyable meanderings. 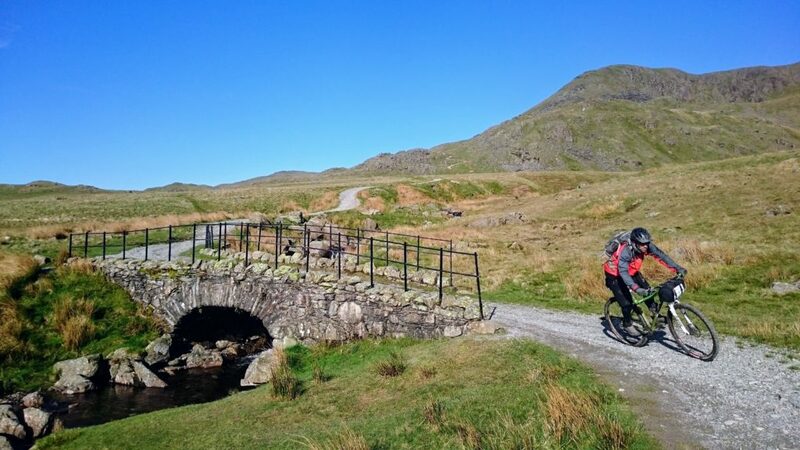 We planned to stop for food in Coniston, only a few crow’s-flight miles away now, but several noticeable hills and deviations stood between us on the official route, and it was a hungry bunch that rolled in at around six. 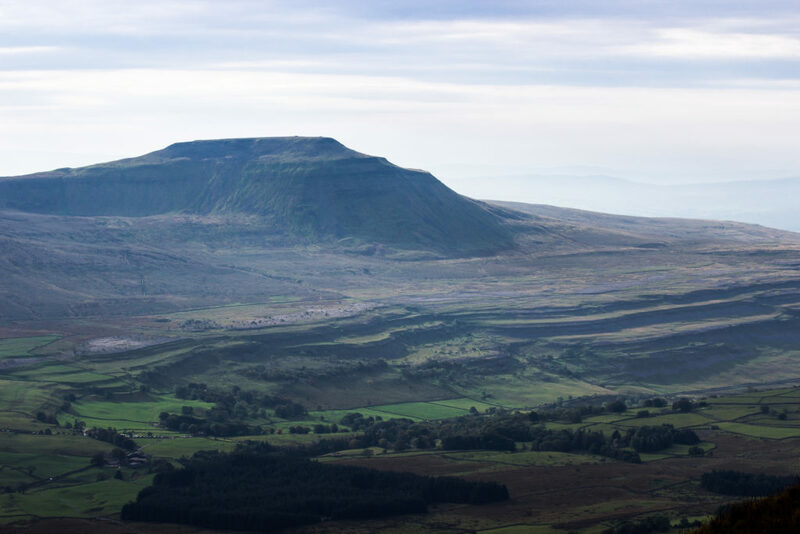 A massive, slow-moving queue at the chippy didn’t help matters, and by the time we set off for Torver our plan of dispatching Walna Scar before bed was looking extremely shaky. In addition to this more than one of our number was feeling the effects of the distance and terrain quite significantly, so after a critical team meeting (in the pub, naturally) we decided to set out for a bivvy spot roughly half-way up the ascent, far enough that we would be sufficiently committed to carry on in the morning, but not too far to attain on our remaining reserves. A very tired band of riders wobbled their way up to the edge of the forest above Stephenson Ground, and at a spot named Natty Bridge we unpacked our gear and attempted to get some sleep. It was here that I discovered that I had made a major error of judgement when I set out that morning. 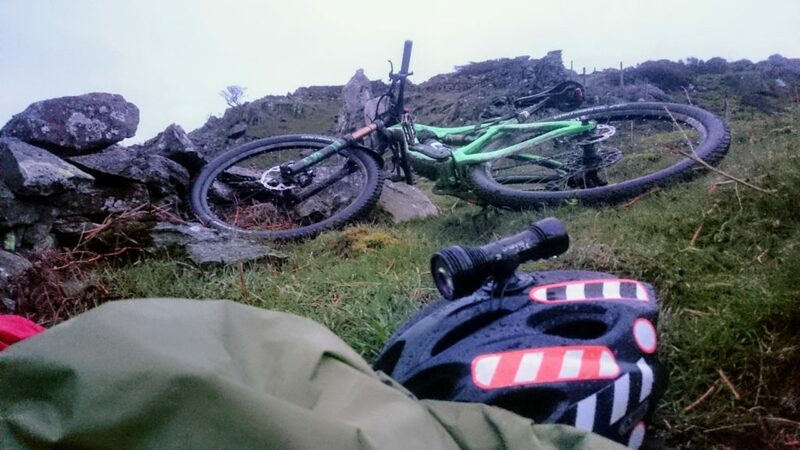 Having trusted the Met Office and XCWeather forecasts I had omitted a tarp from my kit in the name of travelling light, but unfortunately shortly after we set off the predictions for the night changed from <5% chance of precipitation to over 50%. Sure enough, shortly after I’d folded myself into my bivy bag the rain began to fall. Within half an hour or so it had set in steadily with occaisional heavy showers to liven things up, and I was reduced to holding the aperture of my bivy closed tight in an attempt to keep the water out. 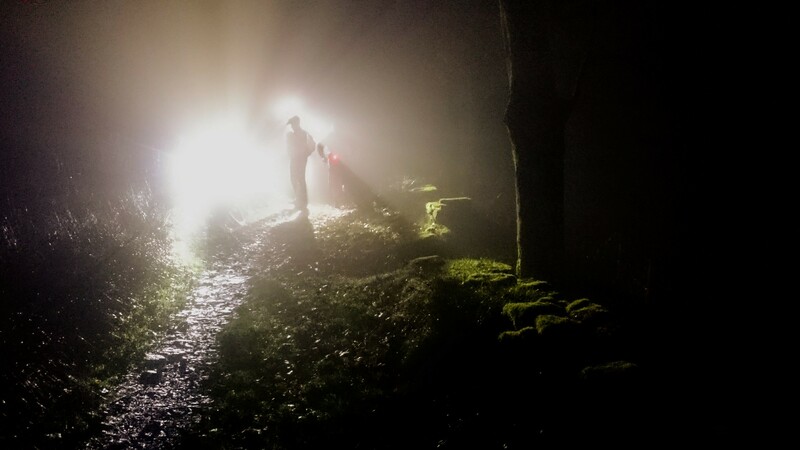 The first few hours were most unpleasant, and I toyed with the idea of packing up and heading back to the van in the dark as I drifted fitfully in and out of consciousness in alignment with the intensity of the downpour. At around 3AM things became almost torrential, and I curled up as tightly as I could to hide from the elements, but after ten minutes or so the clouds seemed to have exhausted themselves and I was able at last to pass out. I awoke again at first light, surveyed the damage to my kit (nothing serious), rearranged a few things and nodded off for another couple of hours until my more sensible companions awoke under their various shelters at about 6AM. We packed and pressed on up Walna Scar, passing several groups of riders further up as they broke camp. The range of kit exhibited both bivy-and-tarp combos and full sized tents. 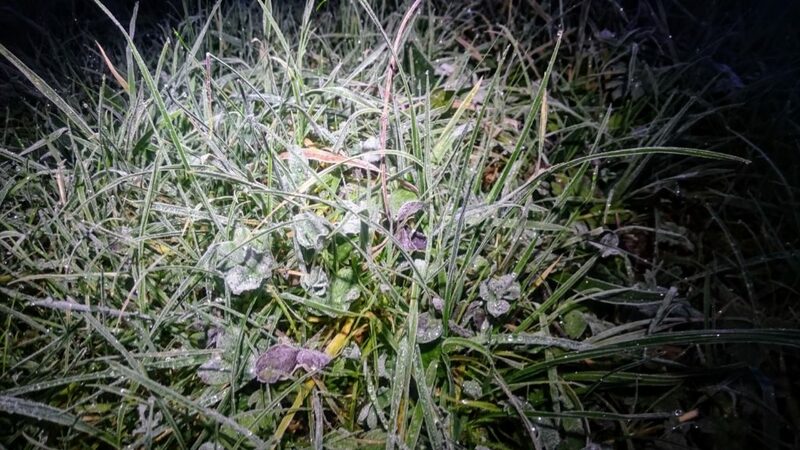 Nobody else seemed to have gone for the unsheltered idiot-in-a-ditch option apart from me for some reason, although I have to say once I got moving I didn’t particularly feel any ill effects from my poor night’s sleep. Admittedly I had to push most of it, but even if I’d been fully rested I wouldn’t have fancied my chances up this relentless gradient. A couple of hardier riders attempted the feat and covered some impressive distance, but nobody quite managed to clean the whole thing whilst we were watching. 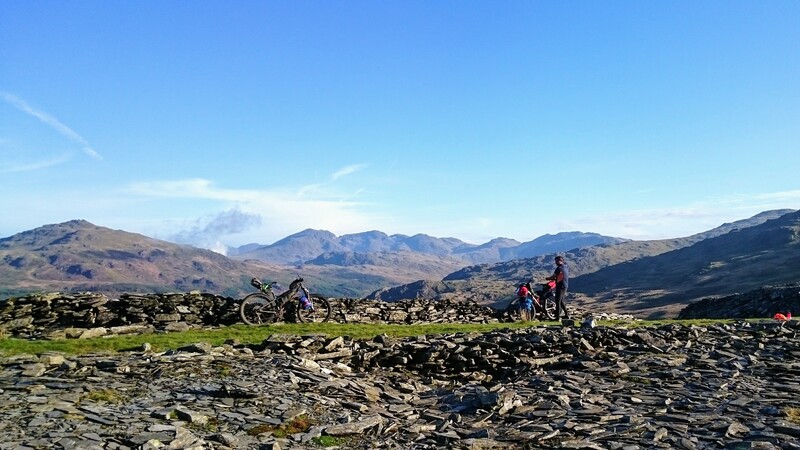 Spectacular views of the Scafells on the way up made up for the discomfort of starting the day on the biggest hill of the weekend, and we made the most of the descent back into Torver, arriving back just in time to pick up a coffee at the small shop there. We basked in the morning sunshine for a few minutes and awaited the arrival of Anthony, who had camped in a hammock a little further down the hill in the woods. 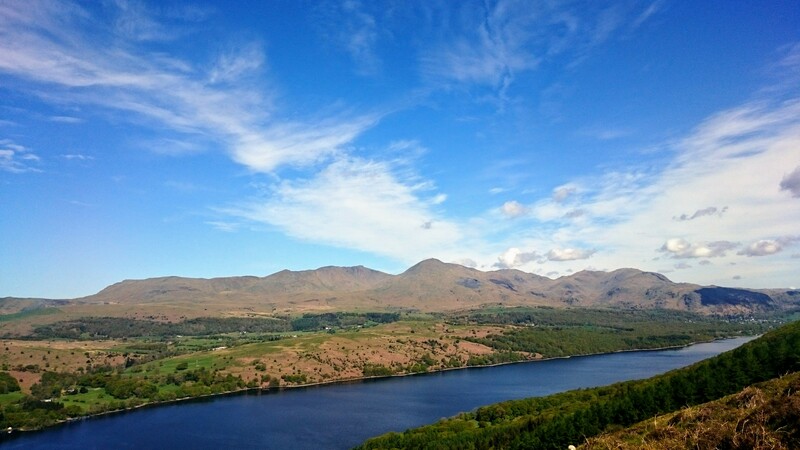 Pressing on around the bottom of Coniston Water and up towards Satterthwaite it became clear that the day was going to be one of those rare, almost-perfect ones: sunny, not too hot, light breeze, clear air, gorgeous scenery, brilliant trails. The preposterously beautiful Lake District was really pulling out all the stops and around every corner we encountered yet another absurdly stunning vista. I was feeling good, not flying exactly but easily keeping up a steady pace and really enjoying the excellent riding, popping and flowing my way down rocky, rooty descents and having to remind myself that I had luggage on the bike and needed to rein it in a little to avoid punctures or crashes. Even being forced to retrace my steps for half a mile or so due to somehow dropping my Garmin, an irritation that would normally have me swearing the surounding air blue for hours, barely dented my by now bulletproof cheerfulness. Not everyone was feeling quite so good, unfortunately, and on the final descent before reaching the shores of Windermere, a technical line down through old growth forest, Russ took a tumble and bashed his shoulder hard. Unable to lift his arm more than a couple of inches, he took the sensible decision to hop on the nearby ferry and roll back to base; it turned out that he had a separated shoulder when he visited A&E the next day, a nasty injury and definitely not one I’d have wanted to ride the remaining miles on, so bailing was definitely the right choice. Having grabbed some lunch and waved goodbye to Russ our reduced group of three pressed on into the final leg, slogging over three successive climbs and descents of Claife Heights, before turning towards Ambleside and another brief break to faff and refuel before the final push for home. I felt amazingly good over the final miles, pushing myself on the climbs despite aching legs, and (by my standards at least) positively flying down the descents. The last downhill in particular, the Three Rivers, was brilliant fun, rutted, rocky, swoopy and flowy, and I had to have a word with myself when I hit one corner at slighly silly speed only to discover that had I drifted a few inches further I would have dropped about twenty feet into a ravine. I took the final few hundred metres to tarmac a bit more sedately and we regrouped to roll the last couple of miles back to the start, tired but satisfied, and pleased with ourselves for completing the entire course with no omissions whatsoever. 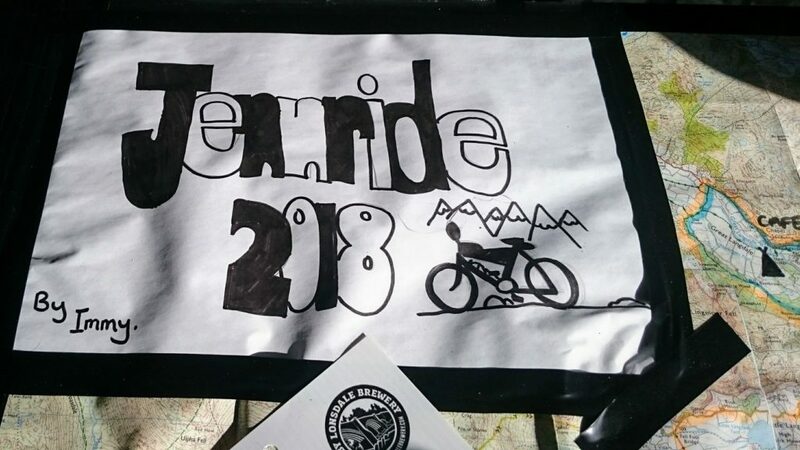 The Jennride 2018 was fantastic, run over a brilliant course in spectacular scenery, with a great atmosphere and friendly riders, and just the right sort of low-key organisation. Huge thanks are due to Rich Munro and team for making us feel so welcome and for putting together such a smashing event, and congratulations to them also on raising over five grand for good causes. I had a brilliant time and will definitely be signing up for another go next year if I can sneak it onto the calendar again. I’ll bring a tarp next time, though. 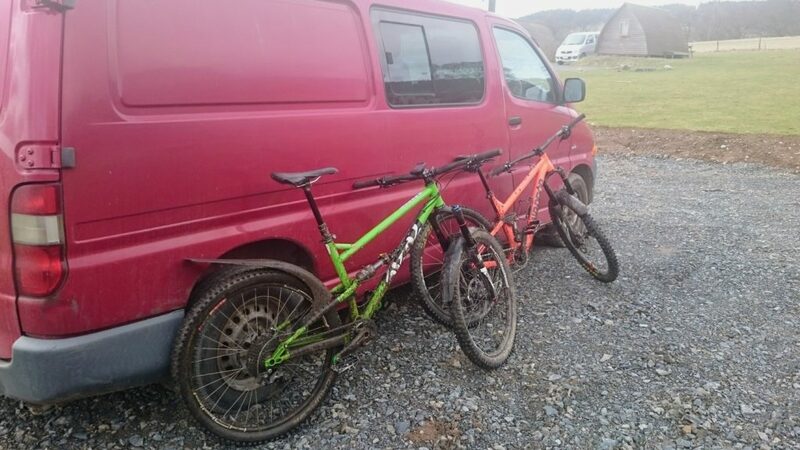 With the winter snows finally receding, I cashed in a few spare days off this week to visit the cornucopia of mountain-biking in the Tweed Valley, in a desperate bid for a little freedom just before the Easter holidays and their compulsory round of relatives and chocolate eggs. We were booked in at the camping pods right next to the Glentress Peel visitor centre, so after driving up straight from the school run, we unpacked and rolled immediately out onto the trails. I had never previously been to Glentress, and would probably have been happy riding anything in this massive forest stuffed with bike trails, but I benefited from being shown around some of the off-piste tracks hidden in and amongst the official routes by my mate Rik, who has been up here loads of times before. I enjoyed the first two runs immensely, in spite of feeling a bit tired for some reason, but the final line we did, one of the EWS stages from 2014, was entirely too steep and slippy and root-infested for my abilities, and I walked down much of it. Having thereby calibrated my guide’s expectations of what he could point me at, Rik decided to skip showing me the more extreme end of things at The Golfie, and we instead spent the next day playing on some enjoyable wiggly segments at Innerleithen in the morning, before heading back to Glentress for a short loop on some of the official trails in the afternoon. Feeling thoroughly wiped out again I headed back to base, leaving Rik chance to get a few more challenging runs in elsewhere in the forest. 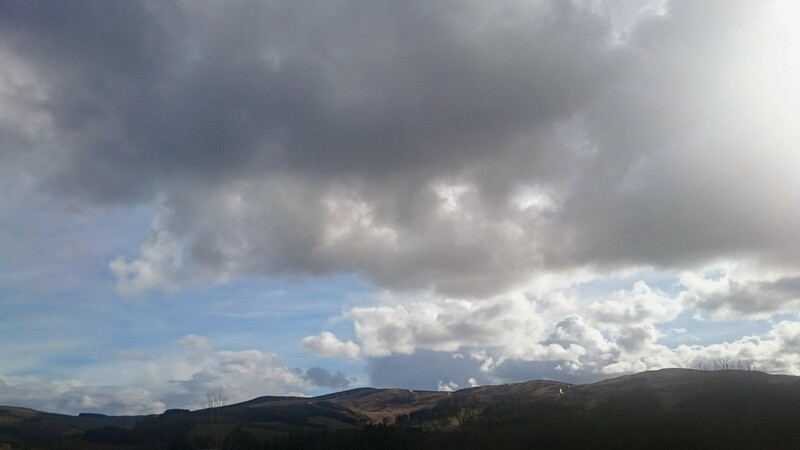 We were lucky with the conditions on Tuesday and Wednesday, and apart from a couple of very brief showers things were rather pleasant, especially in contrast with recent months. Our own shadows made an appearance several times, and I even had to don sunglasses whilst sitting outside the camping pod (in a bobble hat and down jacket, granted, but still). The ground conditions weren’t too bad either, there were plenty of puddles and muddy spots but nothing show-stopping, and we only ran into the remnants of the last few weeks’ snow in a couple of spots at the very top of the hills. Things looked set to turn on the last day, however, and after examining the weather forecast we decided that we didn’t fancy the 80% probability of heavy rain lined up for the Peebles area, and instead made an early dash for the morning’s predicted clear skies in the eastern Lakes on the way home. I had been meaning to ride the classic Nan Bield-Gatescarth loop for years now, but hadn’t yet managed to get round to it, so this seemed a perfect opportunity. The route seems to divide opinion quite dramatically; whilst some do rave about it, I know several people who have told me in no uncertain terms that it is not worth the hike-a-bike slogs over the two main passes, and that the descents are somehow simultaneously boring, and too rocky. Those people are wrong. After an admittedly massive 500m-vertical hike past Small Water to earn your first descent, Nan Bield starts off with the sinuous curves pictured above, which are as entertaining as they look, before turning into several miles of more traditional moorland singletrack. This is rutted and challenging in places, but very enjoyable all the same, even if you do catch a pedal and wind yourself on a pointy bit of the scenery like I did. There is the odd tricky spot, small drops on corners, damp multiple line rock gardens, that sort of thing, but it’s all rideable by a competent MTBer (I nearly rode all of it, at any rate, and I’m nearly competent, on a good day). Further down the valley things were a bit boggy in places, but we have just had a very wet winter and we still didn’t get properly stuck at any point, so it’s clearly a reasonably all-weather route. From above Kentmere the short hop over to Longsleddale is lovely, a moderate drag (for the Lakes) through fields, followed by a diverting little drop back down to Sadgill, where you pick up a rocky byway for the final haul back over Gatescarth. 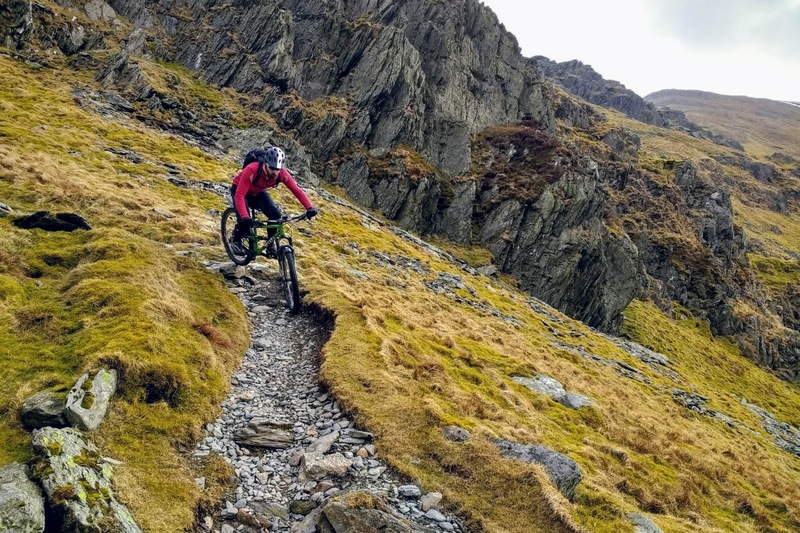 This long, stony track is a bit soul-destroying, especially if you’re tired, but most big rides in proper hills contain stretches like this, it’s all part of earning the subsequent fun bits, and the views were pleasant throughout. The descent from Gatescarth is frequently written off as a bit rubbish, so I was a bit worried that the ride might peter out with a concrete farm-track or something, but I was mistaken. It is definitely not perfect flowy singletrack or full-on freeride schralpcore, true, but it swoops and curves beautifully all the way down the hill, a river of loose rocks between earth banks, where you can drift crazily round the corners to see how fast you dare go. 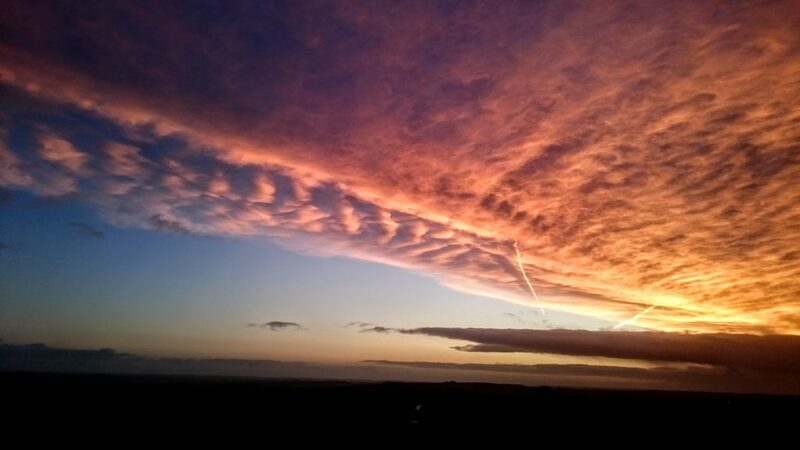 And the other great thing about it is that it drops you right back at the car park, job done. 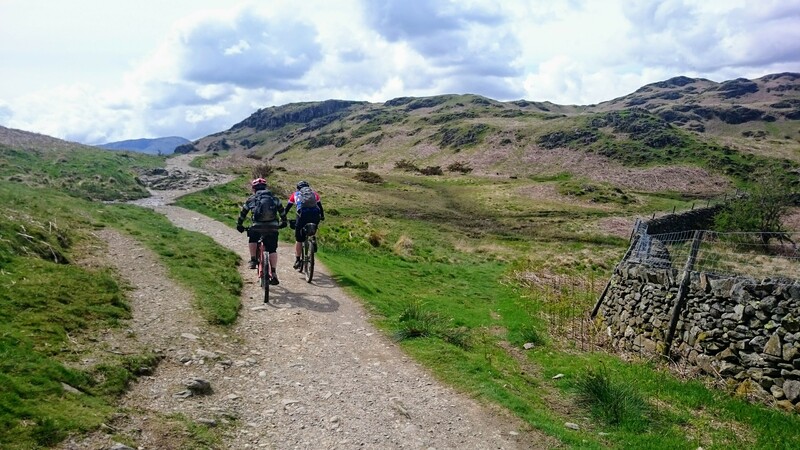 Overall, the Nan Beild-Gatescarth loop is an excellent ride, a good solid mountain outing that you can put away in about three hours, leaving you feeling like you’ve properly earned a couple of excellent descents amongst the spectacular scenery of the Lakes. I’d definitely come back to ride this one again. Looks like I spoke too soon, winter isn’t done with us yet. Happily, it being a Sunday, I got chance to go out and play in the fresh white stuff, rather than just having to deal with the fallout from whatever plans the weather might have scuppered. 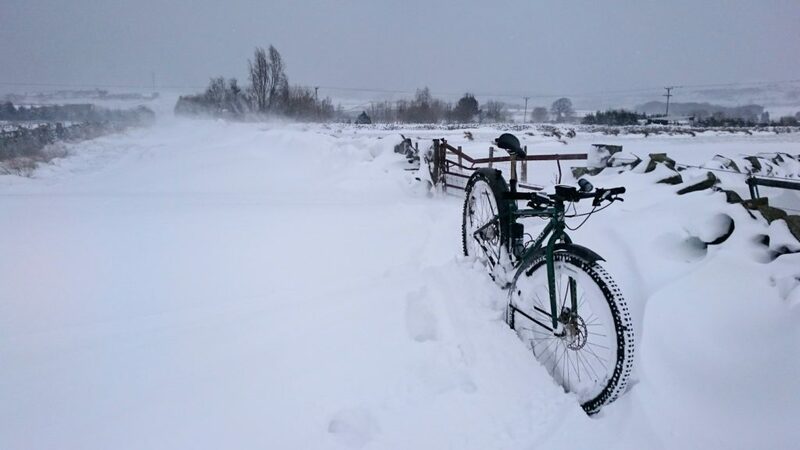 The drifts whipped up by the strong easterlies that brought us this latest dose of freezing fun made a 100mm fall quite the challenge to slog through in places. 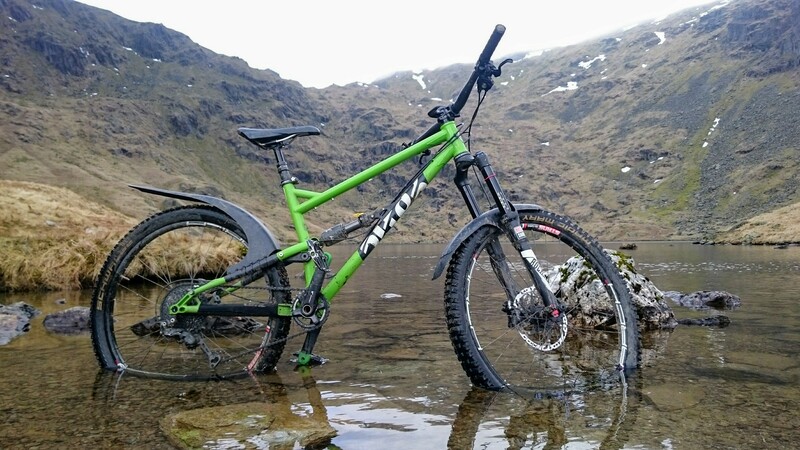 Whilst the Krampus is pretty good in these conditions, it hangs up like any other bike when it hits serious depth, so I did spend a fair bit of time pushing, and even ended up with the bike on my back fighting through waist deep powder on occasion. 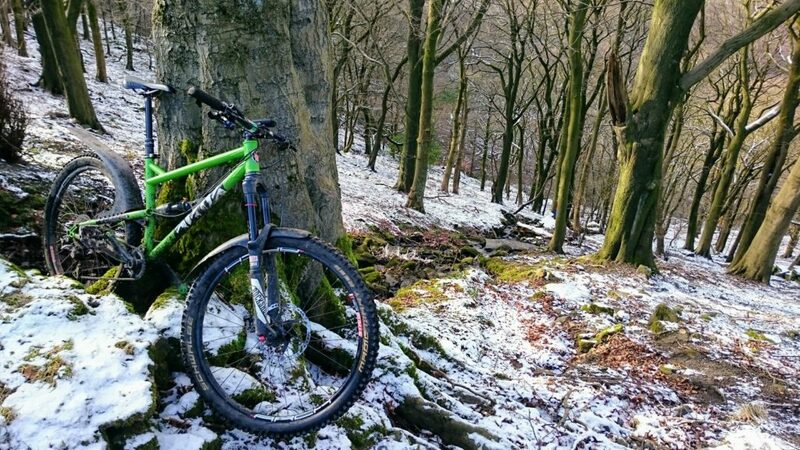 It’s very satisfying to break a completely new trail over a frozen moor, though, and pleasant to be out on the edge of things away from everyone else, even if you aren’t actually riding everything entirely cleanly. 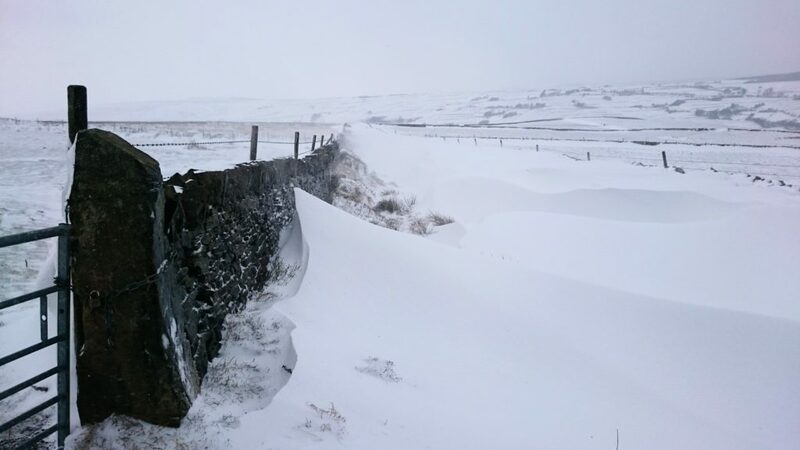 Once past the drifts I did manage to get all the way down Ramsden Road without a single dab, which was quite pleasing as it was hard to see where the usual massive rocks and ruts were lurking under the windblown spindrift. Where the snow wasn’t too deep the ground was lovely to ride over, squeaky powder alternating with crunchy frozen mud. A few short sections into the biting headwind were quite tough going, and my hands got a bit cold towards the end, but mostly I stayed dry and comfortable. 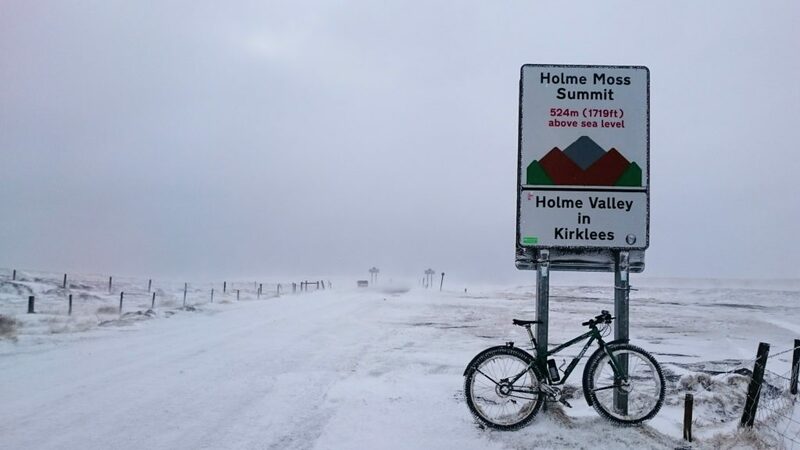 I finished off my loop with a slightly daft jaunt to the top of the closed A6024, better known as Holme Moss. Traction was pretty poor despite there only being an inch or two of snow cover on the road, mostly because the snow was grit-melted slush, compacted in places by the passage of a few One-Life-Live-It-Let’s-Offroad types, and the regular drifts, whilst smaller than those encountered earlier, were deep enough to stop me dead. I kept on slogging to the top helped by the hefty tail-wind, took the obligatory photograph to prove my daring ascent, and then quickly turned around into the teeth of a properly biting polar blast. I had to pedal most of the descent just to keep moving against the gale, and even further down out of the worst of it I think I topped out at about 10mph. 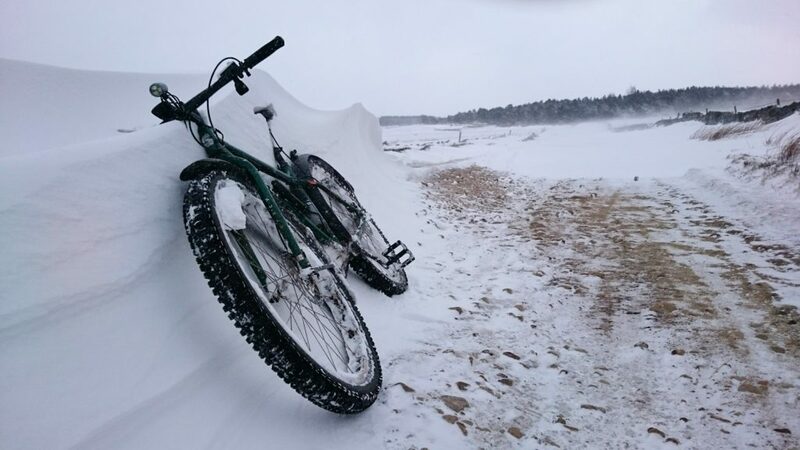 This was largely in the name of safety, as any serious attempt to manoeuvre on the frequent drifts escalated into entertaining fishtails across the carriageway, and I was highsided off into the powder a couple of times. But by the time I reached Lane village the road was clear and I dropped back into the valley at more normal speeds, freezing my hands in the process. It was an enjoyable expedition out into what are pretty novel conditions here in the normally drizzly north, and I enjoyed the challenge of slogging through the drifts, but I think we can all agree that winter has made its point more than adequately. It’s time for spring now, please. Bit quiet here, I know, mostly because nothing much of interest has been going on. 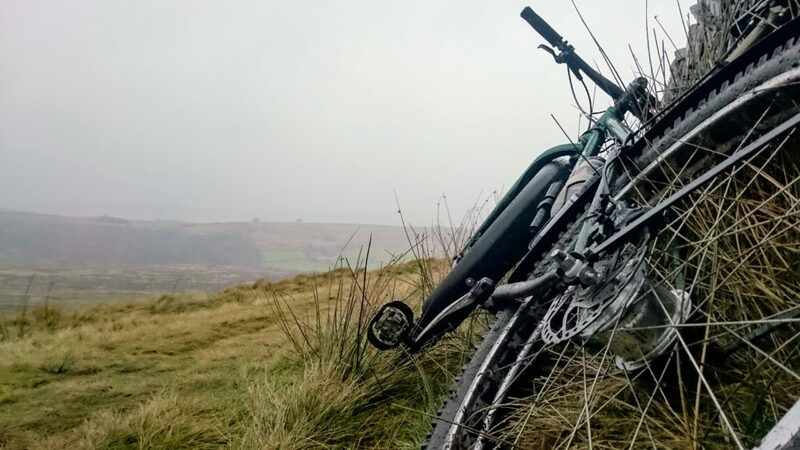 I have been out riding, in spite of the weather, and highlights included a day being shown around Hebden Bridge (above), some enjoyably bleak jaunts on the Krampus with it’s eight shiny new internal hub gears making the hills a bit easier (below), and some entertaining Monday Night Pub Rides. I’ve done nothing particularly noteworthy apart from that though, hence the lack of updates. There are plans afoot for more interesting adventures in the coming months, however, and I need to get some serious miles in from around now if I’m not to suffer too much in the execution of said schemes. I did also pop out to the French Alps to visit my unfortunate little brother, who is unlucky enough to have to live in some obscure backwater called Val-d’Isere, the poor chap. He has had to contend with two metres of snow just down in the village this year, but he’s gamely made the best of things by spending most of his time snowboarding on it, when he’s not enduring his job, getting paid actual real money for playing his favourite records in a trendy nightclub. I’m sure he envies me my 9-to-5 life of trudging from school run to spreadsheet to conference call back in drizzly little England, but he was good enough not to go on about it, which was kind of him. 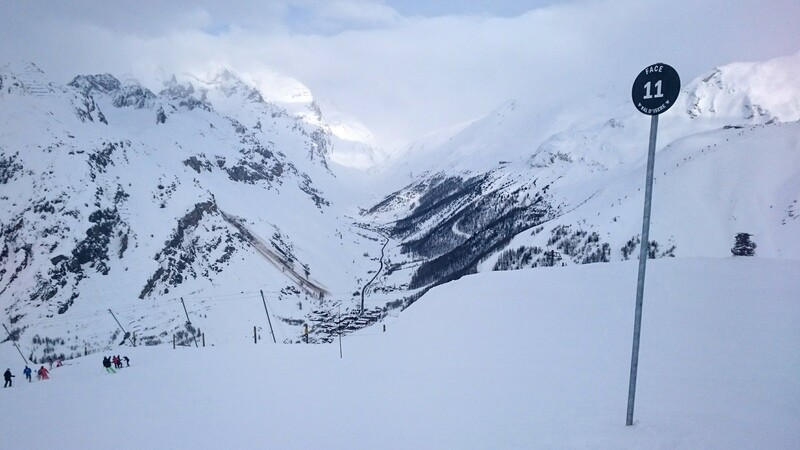 Once I’d stopped staring blankly into space, contemplating certain of the decisions I have made in my life, I quite enjoyed the skiing, and even managed to skitter my way down a proper classic black run a couple of times (below). Apparently the off-piste stuff hereabouts is amazing, but as I was out with the nine-year-old I didn’t get chance to sample any of it. Maybe next year. That there is my shiny new birthday present to myself, ruined, ruined I say, by less than one hour’s racing around a muddy park. As you can see, the chain refuses to stay on due to large chunks of Todmorden being stuck to the bike. 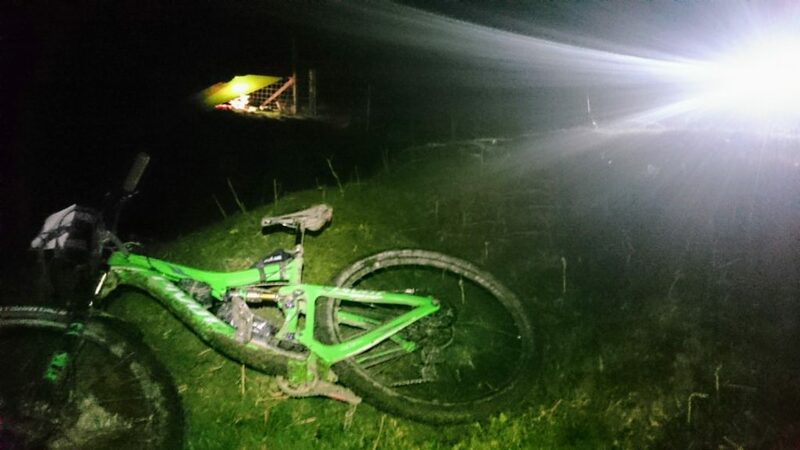 Less obvious is the fact that the front brake packed in completely on lap one, which made for an interesting ride – although pleasingly I did clear both The Muddy Corner Of Death and The Other Muddy Corner Of Death on every lap with only rear wheel slides to slow me down. 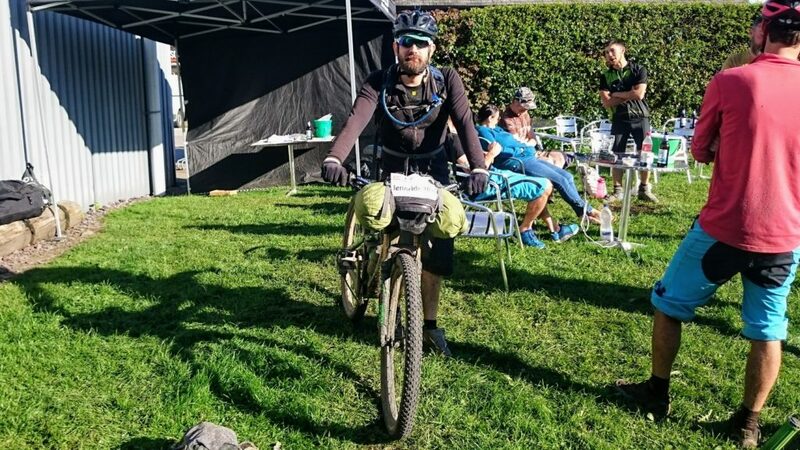 In spite of these issues it did however manage to carry me to the end of the race, which is more than I can say for its predecessor on the previous two attempts, when we were thwarted by punctures both times. I also fared a bit better than my mate who managed to wrap most of his drivetrain around his rear wheel inside the first lap. Cyclo-cross is tough on bikes. Yes, I got lapped three times by the race leaders, but we’ll gloss over that and bask instead in the glow of satisfaction earned by actually completing an entire pushbike race. There is no glow of satisfaction relating to the year as a whole unfortunately. There were a few good days out, but largely my riding was curtailed by various external exigencies relating to work and family, as well as a probably not-unrelated malaise that kept me on the soft furnishings, wallowing in self-pity and laziness. I did manage to turn that around a little in October and November, but then some heavy-duty dental work slowed me down for a few weeks, and then it was nearly Christmas, and the excuses just keep on coming don’t they? I’m not one for New Years Resolutions, but I am going to attempt to get more miles in next year, I promise, and some of them might even be interesting enough to write a few words about. I’m going to open a bottle of something fizzy and make some plans. Happy New Year! November is usually really hard. Every year I dread this month, when the clocks have just gone back, and daylight is fast ebbing to its annual minimum. The little sunlight that manages to filter through the thick blankets of damp cloud hits sodden ground covered in dead leaves and warms nothing, but it’s never cold enough to be interesting. There might be the odd patch of ice to catch you out on a shady corner, but there are no snows or frozen waterfalls to pretty up the scenery. Every day it gets darker and gloomier, and unlike December there isn’t even the mixed-blessing of the holiday season to distract from the grinding dreariness of everything. Most of the time it just drizzles, or blows, or both, and it takes a concerted act of will to get out of the door and turn a pedal. I usually spend most of my free time in November on the couch with a bottle of wine, feeling guilty and hiding from the world. But this year I am trying a different approach. So far I have been out on two pre-breakfast rides, one night ride, and started one CX race. The latter didn’t go so well, as I DNFed after a very muddy lap and a half due to a puncture. I did at least line up at the start, though, which has to count for something, and I may well have another crack at actually finishing at the next round. 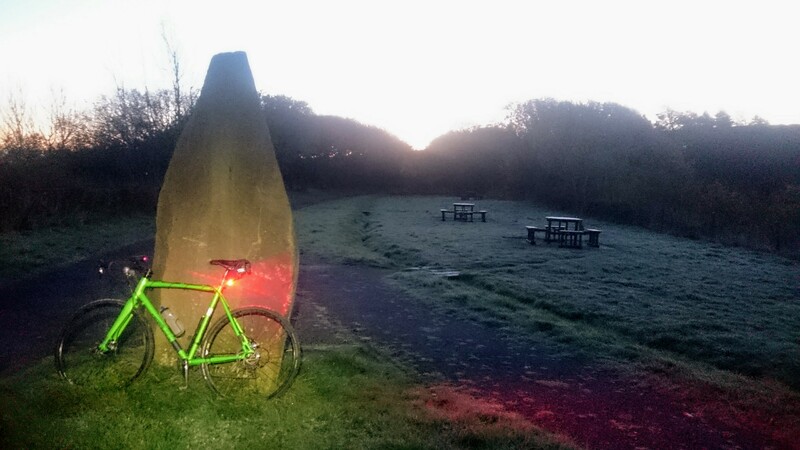 The other rides have all been splendid, particularly this morning’s spin around the frosty back-lanes, watching the day dawn slowly around me. Grouse and pheasants skittered brainlessly along the side of the track, and a hare loped out of the way before stopping to observe the bizarre, wheeled madman rolling along the frozen grass. Something small and incredibly fast, a weasel perhaps, shot ahead at over 30mph as I descended into the cold of the valley, where the temperature dipped below -3°C. 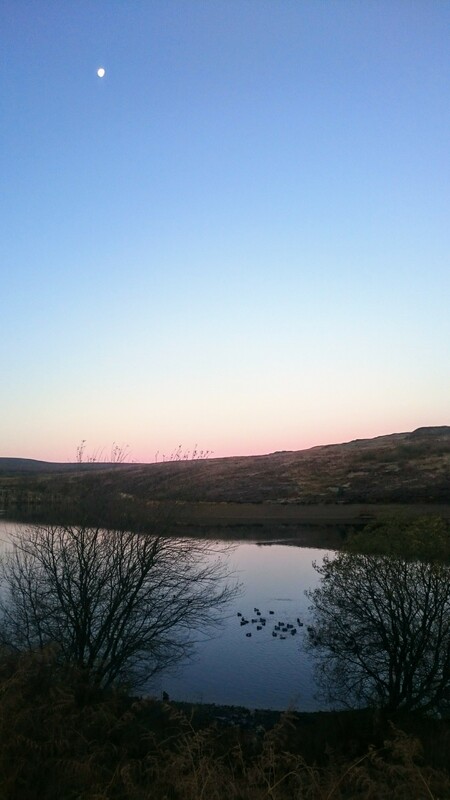 I climbed a reservoir dam wall to practise my CX shoulder carry as the sun rose above the distant cloud banks, before rattling down the final hill to home and breakfast. 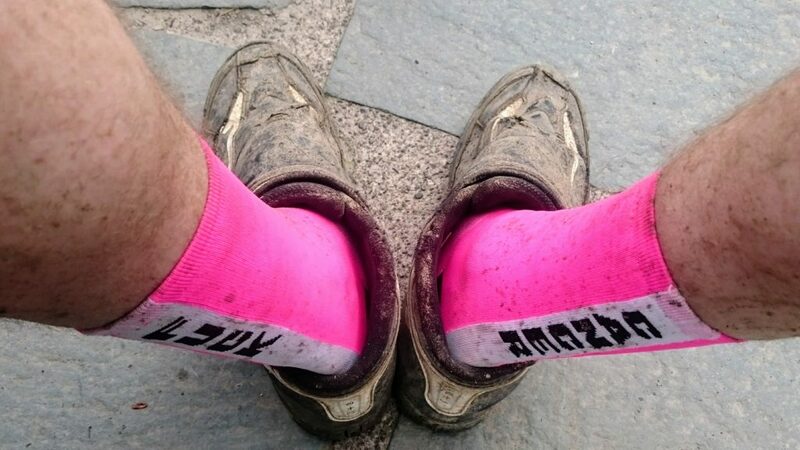 The toes on my left foot had gone a bit numb but apart from that everything seemed to be working just fine, and with the ground mostly frozen the bike barely even had any mud on it. The remainder of this month’s riding is unlikely to be similarly painless, but I’m determined to keep up this current momentum for as long as I can, and hopefully avoid sliding into the lazy despondency that November normally brings. A few more mornings like this, though, and it will definitely feel like the effort is worth it. Somewhere under all that brash and rubble there was once a bike trail. 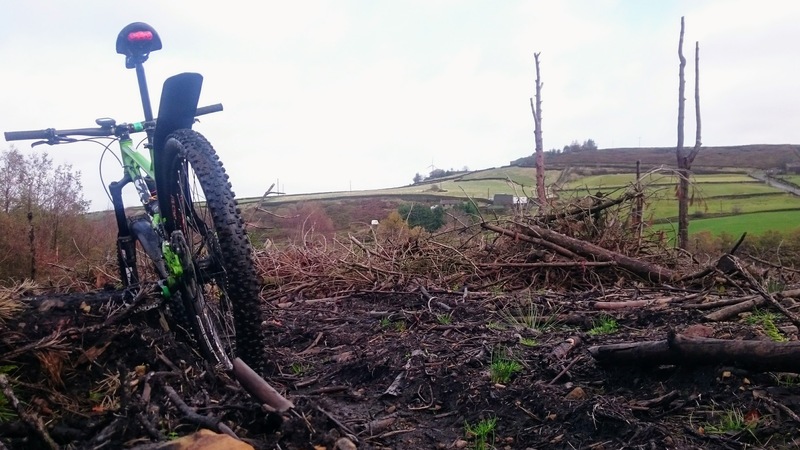 It was short and led nowhere and comprised a series of jumps and berms wriggling between rotting conifers in a dank industrial plantation on the edge of the moors. 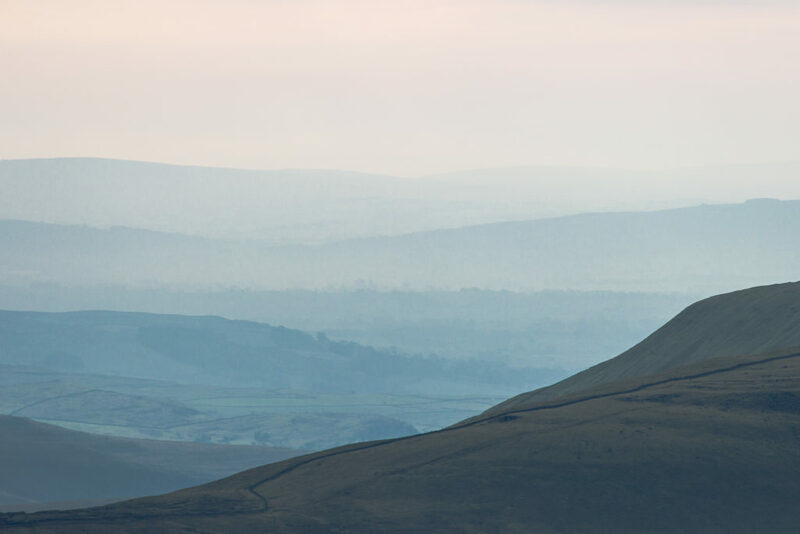 I didn’t visit it very often because riding it was, frankly, at the very limit of my ability, and it was usually so wet and covered in slime and pine needles that it was rarely worth the trek to have another crack at its gaps and chicanes. I don’t think I ever saw another rider up there, indeed I rarely saw so much as a tyre track to indicate that it was still in use at all. Whoever built it clearly abandoned it some time before I was shown it by a friend, four or five years ago. The last time I visited it, in early summer, the foresters were in the process of harvesting their cash crop, and the chainsaws and massive machinery of industrial wood-processing were making short work of the trees. I hadn’t been back up since, until I decided to take a detour off today’s ride to see if anything remained of the unknown diggers’ work. 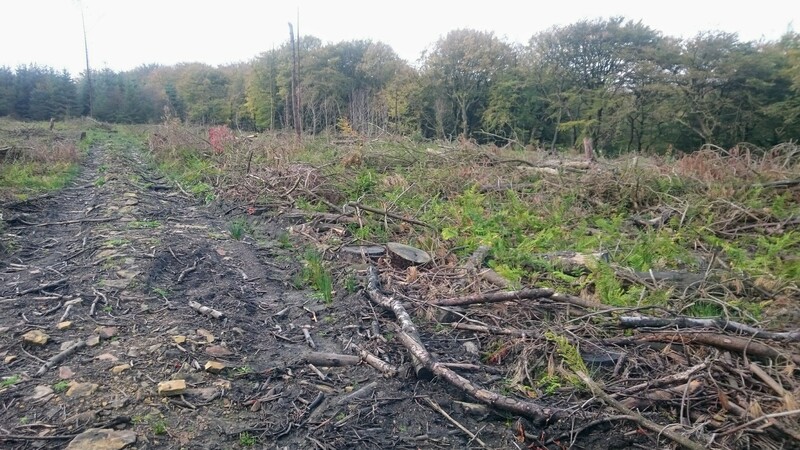 It quickly became clear, lurching over the detritus left by the felling, that everything had been obliterated. I couldn’t even see a trace of the dry-stone walls that the builders had incorporated into their jumps, let alone the minimal berms or kickers or gaps. This small trail was built in a working wood, unofficially and without regard for sustainability or safety, and if it was tolerated by the landowner that was the most that could be said for it. It is no great loss, objectively, as even local riders obviously used it rarely, and its destruction only occurred as part of the normal process of management of the land upon which it was illicitly constructed. Still, I am sad that it has gone. 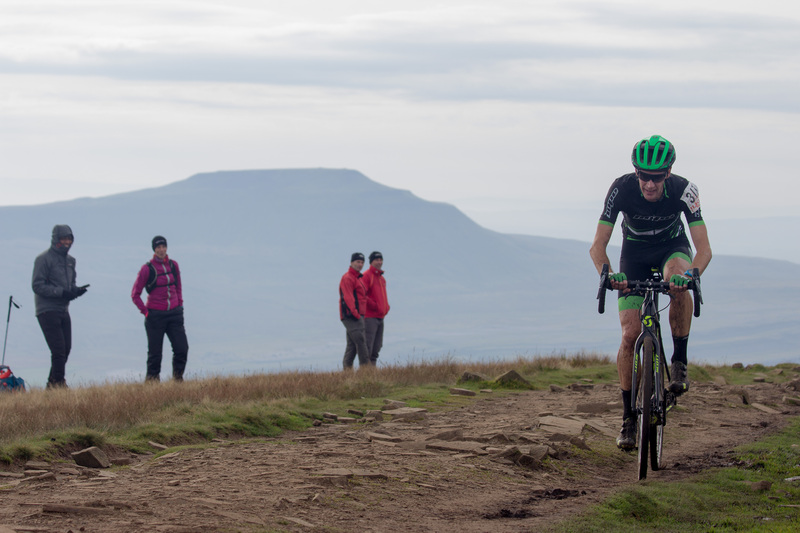 Today I took part in my first cyclocross race, as part of my recently launched campaign to not actually die in the attempt to ride the 3 Peaks race next year (previously). It just so happened that the local secondary school was hosting a round of the regional CX race series this weekend, and a couple of friends were going to have a go too, so this seemed as good a time and place as any to start. 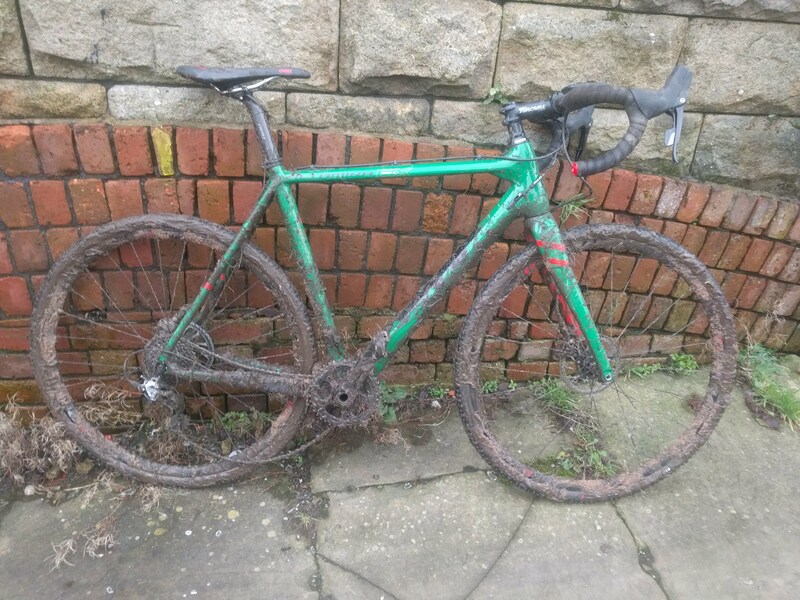 Happily, my road bike is actually a CX bike in disguise, so all I had to do was dig out the pair of knobbly tyres that I bought on a whim a year or two ago, remove the mudguards, and fit a shorter stem. These technical adjustments took under an hour, which as it happened was very nearly as much time as I had spent on the physical preparations for my racing debut in this discipline. As is my usual tactic, I gridded myself right at the back to ensure I kept out of the way of the fast lads, which turned out to be a good idea; everyone was a fast lad, apparently, and they all shot off into the distance with alarming speed once the starting whistle blew. I spent the ensuing laps with my heart rate pegged and my eyeballs nearly popping out of my skull, hanging right off the back off the race like the unfit mess I currently am. I was lapped by the front runners after perhaps ten minutes, and then by pretty much everyone else, as far as I can tell. After about half an hour I started to feel a bit less than utterly terrible and made back a few places over the last couple of laps. The whole thing was wrapped up in about fifty minutes: short and very, very sharp. The course was classic cyclocross, apparently: approximately 95% uphill, frequently through a swamp, or a sandpit, or a swampy sandpit. The downhilll bits were all carefully taped out to make them off-camber and almost impossible to ride at more than 5mph. There was a special hurdle section to make you either get off or crash hilariously, an amusing tractionless bit over an awkward grassy lump, and one of those hypnotic spiral-of-death things in the middle of the football pitch. I didn’t crash at any point, my hard-earned mountain-bikerly poise and grace carrying me easily through the various slip-slidey grassy banks, bunkers and boggy bits. I also found the cornering drills of last year’s speedway sessions handy on the numerous grip-free bends and turns. Technically I really rather enjoyed the exercise, it’s always fun coaxing a slightly daft bike over amusing terrain. I just need to work on the small matter of the woefully underpowered engine. Oh, and the remounts, being able to jump back on after getting off would be a handy skill to acquire given that I had to get off about fifty times a lap, which is roughly par for the course, I’m told. 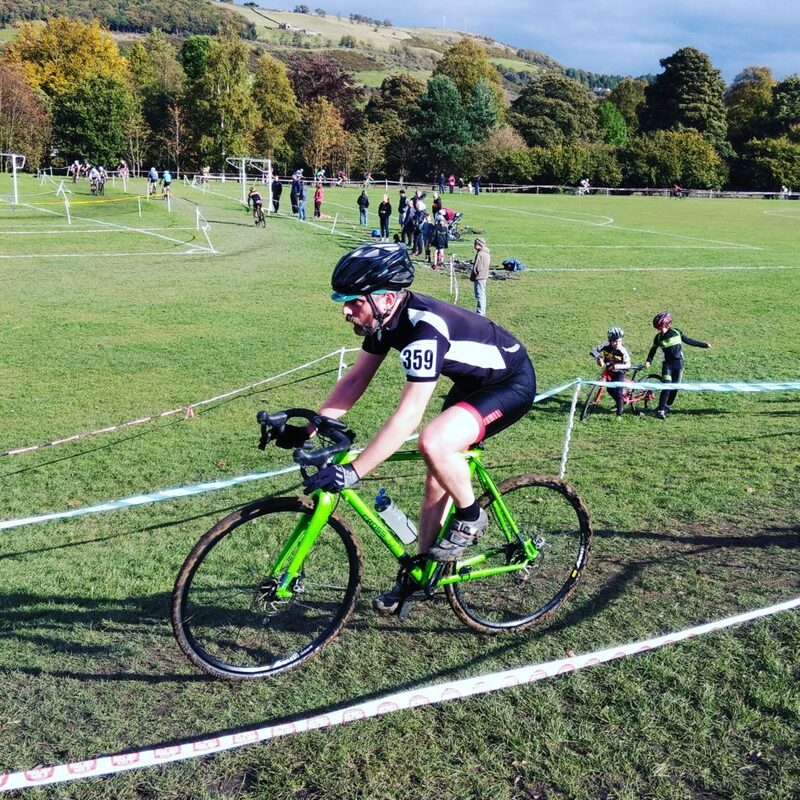 So, in summary, my first CX race was awful. Apparently there’s another round not too far away next weekend; I might see if I can have another go and get some more practise in. 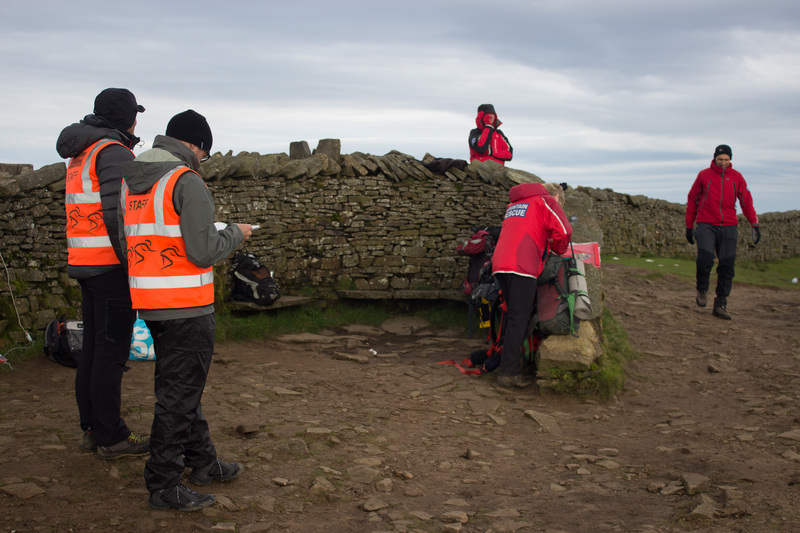 I spent several pleasant hours last Sunday standing around on top of Whernside whilst 600 or so hardy individuals passed through our official checkpoint for the 55th Three Peaks Cyclo-cross, which I was helping to marshal. I actually had very little to do as the technical race-monitoring stuff was handled by members of the Bowland MRT, so I mostly just snapped pictures, admired the views, and occasionally prevented oblivious ramblers meandering right through the crowds of frantic racers attempting to check in amongst the tangled wires and boxes of dibber electronics. Marshalling the race gets you a guaranteed spot in next year’s event, and I think I’ll probably have a crack at it. I’ll need to do a bit more riding in the run up than I have recently though, I’ve not touched a bike since July, hence the lack of updates hereabouts. The summer holidays, work, and family concerns have totally wiped out any free time, although things seem to be settling down a little again so hopefully I will get some miles in somewhere interesting soon. In the meantime, here’s a few more snaps from Sunday.